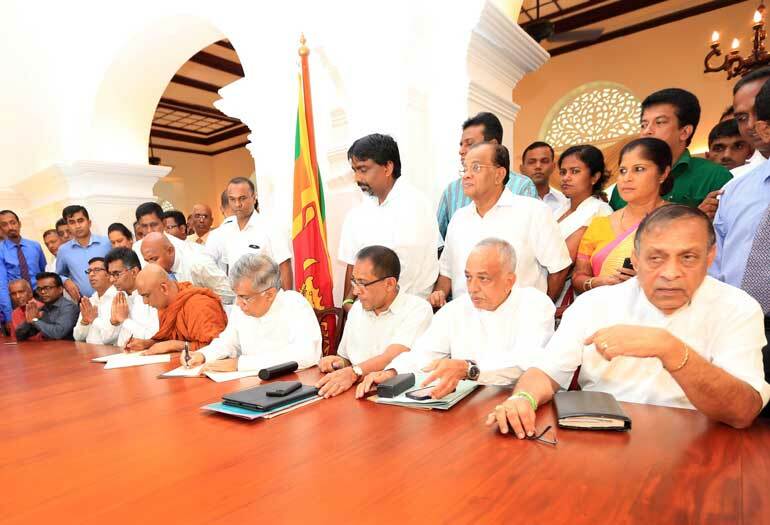 The threat of Mahinda Rajapaksa’s political re-emergence has unified the fractured rainbow coalition that swept President Maithripala Sirisena to victory on 8 January, with several parties signing agreements yesterday to contest parliamentary elections under a single banner. 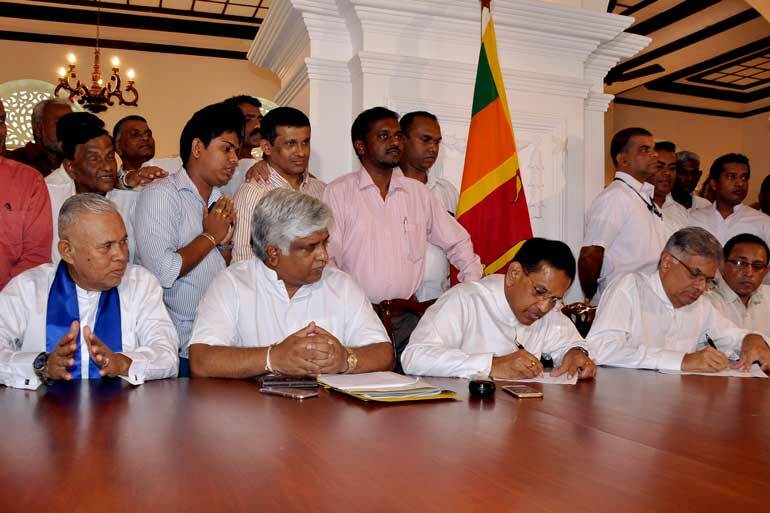 The United National Front for Good Governance (UNFGG) was inaugurated at Temple Trees yesterday, with several parties that backed the Sirisena ‘common candidacy’ in January regrouping to contest against the UPFA. Twenty-four hours ahead of the close of nominations for the 17 August poll, President Sirisena’s bid to consolidate his position within the SLFP appeared to have failed and the defeated President Rajapaksa is likely to be the de facto leader and presumptive premier of the UPFA. During their 160 days in Government, the election alliance showed signs of cracking with SLFP members and the JHU, which backed President Sirisena, strongly critical of the UNP. With the rainbow coalition rebanding, the 8 January battle lines have been drawn again, with Rajapaksa likely to canvass hard on a nationalist platform, while the alliance pledges good governance and reconciliation between communities in the island. “We were to contest separately, but on the road to good governance, obstacles get in the way. Mahinda Rajapaksa and his forces of corruption and division are trying to stage a counter revolution,” Prime Minister Wickremesinghe said after formal agreements were signed between the parties at his official residence yesterday. Wickremesinghe said to combat the threat from the former President and the regressive forces supporting his attempt to regain power, the political movement that defeated him in January had to regroup. “Together let us sweep the Rajapaksa regime into the dustbin of history,” the Prime Minister charged. Since political parties could not be registered after the election is declared, the UNFGG will only be registered with a new symbol post-poll. “For now it will be a political movement, contesting under the elephant symbol,” Wickremesinghe explained. The Premier assured however that parties would be able to assert their own identities even in the new Parliament that is elected on 17 August. “There will be a leadership council formed to take consensual decisions and to protect the individual identities of parties in this alliance,” Wickremesinghe explained. JHU General Secretary and Minister of Power and Energy, Patali Champika Ranawaka, who addressed the gathering after the agreements were signed, said the Sri Lankan people were not willing to go backwards and into the dark ages that preceded the electoral revolution of 8 January. “A huge investment is being made as we speak to push this country back into the darkness, to restore family rule and corrupt politics,” Ranawaka said. Under the circumstances, the JHU strongman said it was no longer possible to remain in an alliance with the UPFA or contest under its banner. Ranawaka said the JHU hoped the new Parliament would ensure the abolishment of the preferential system, a new constitution and corruption-free politics. SLFP dissident and Minister of Health, Rajitha Senaratne, hailed UNP Leader Wickremesinghe for committing himself so wholeheartedly to the election of the General Secretary of the SLFP as president of Sri Lanka. “These two parties have a historic rivalry and they have always been at loggerheads. But the UNP Leader made that sacrifice in January and decided to wage a battle of ideas instead of playing partisan politics,” Senaratne said. “We begged that corrupt individuals should not be included in the UPFA nominations list. But our appeals fell on deaf ears. How can we contest alongside them? How can we go before the people and ask them for a vote?” Senaratne echoed the fears of SLFP members who must now contest with a majority of Rajapaksa loyalists on the ticket. Minister Senaratne said that the 49 political and civil movements that had backed the January 8 movement for change were regrouping now, including Sobitha Thero’s National Movement for a Just Society, trade union collectives and civil society organisations. SLMC Leader Rauff Hakeem said that the UNP had been a main force behind the 8 January victory and the movement was realigning itself behind the party once more. “The rainbow alliance comes back together today, united for good governance,” Hakeem said. UNP Leader and Premier Ranil Wickremesinghe, SLFP dissidents and presidential loyalists, Rajitha Senaratne, Arjuna Ranatunga, M.K.D.S. Gunewardane and Earl Gunesekera signed a Memorandum of Understanding at Temple Trees yesterday to contest under the UNP’s elephant symbol. 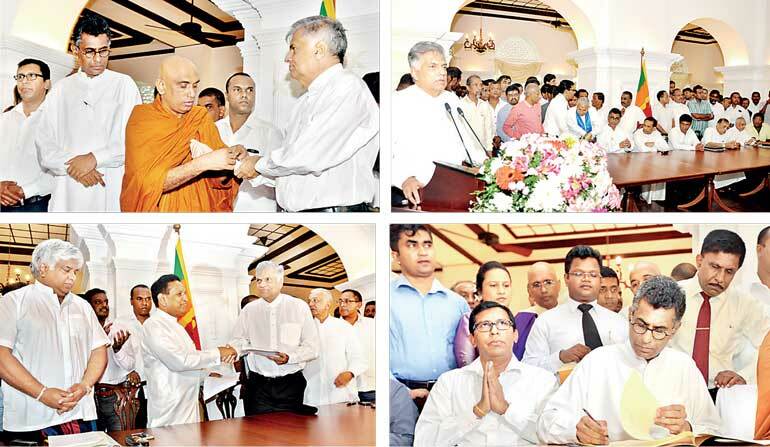 JHU Chairman Athuraliye Rathana Thero also signed a similar MoU with the UNP to contest the polls under the same banner. Ranatunga will contest on the UNP ticket from the Gampaha District, while Senaratne will contest in the Kalutara District. Ranawaka will contest on the UNP list from Colombo. The Sri Lanka Muslim Congress, the All Ceylon Muslim Congress led by Rishad Bathiudeen and Mano Ganeshan’s Tamil Progressive Alliance will also contest under the UNFGG at the poll. All the speakers at yesterday’s signing ceremony stopped short of criticising President Sirisena who still functions as the chairman of the UPFA and the SLFP. UNP General Secretary Kabir Hashim told Daily FT that the UNP nominations list was delayed to accommodate the crossovers, after a series of agreements were signed between the party and the separate groups. Hashim said the UNP would send its lists to the district by Sunday night after they were finalised by evening.